‹ Diver Scallops, Pacific Salmon Roe Caviar & Basil Mayonnaise Sauce. This recipe was originally posted on May 12th. This version makes the cooking of the Tuna simpler and more controllable. Cathie brought home from Gadaleto’s, the finest fish store in the Hudson Valley, sashimi grade Tuna. The color was so richly maroon It deserved to be treated as sashimi. Raw is one way, 15 seconds a side is the other and the one decided on. Along with a dipping sauce & Roland’s Ginger Glaze. it’s an amazing taste treat. 2. In a non-stick frying pan heat the Peanut Oil. 2, When the oil is starting to smoke, add the Tuna. 3. Sear untouched for no more than 15 seconds. 4. Turn & sear untouched for another 15 seconds. 5. You will now have lovely, very rare Tuna. 6. Cut the Tuna into 1-1/2″ pieces. 7. 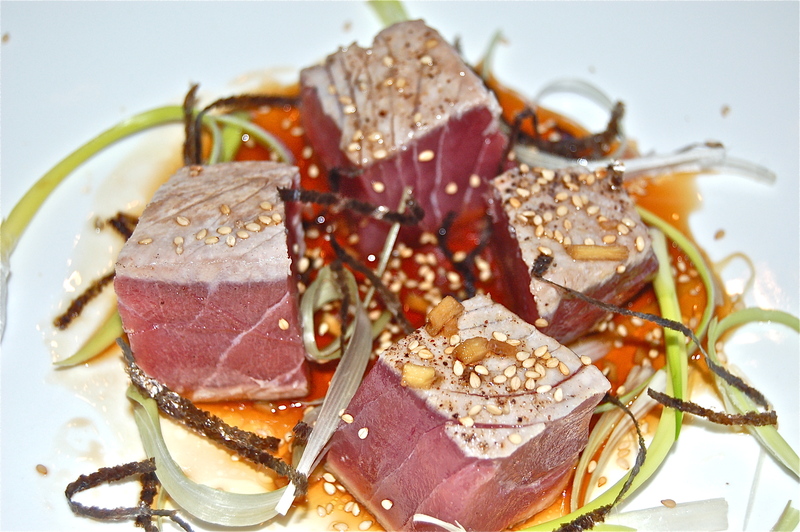 Plate the Tuna, drizzle with the Asian sauce, top with the Nori & surround the plate with the optional Ginger Glaze. 8. Sprinkle on the toasted Sesame Seeds & serve. 1. Whisk all the ingredients together. 2. Drizzle onto the plate & top with the Tuna. 3. Add the Scallions & serve. 4. Bring the remaining sauce to the table.